Psychology of Nail Biting: Why do we do it? A habit frowned upon, yet practiced by millions. Why do we bite our nails? As a nail biter myself, I have long listened to the nagging from adults around me to stop the disgusting habit: “It is very unbecoming of a young woman to bite her nails”. I cannot remember when I first began to bite my nails, but I cannot remember a time when I haven’t. I have never tried very hard to stop because I always felt an unusual sense of comfort. Before tests or whenever I am feeling especially anxious, I begin to gnaw away at my fingers. The skin around my nails become red and irritated, and my fingernails unnaturally short. I never paint my nails because I know that I’ll pick it all off out of boredom or nervousness. Despite my parents’ constant badgering for the past 10 years of my life, I was never able to stop. I was curious as to why I felt this way, so I conducted research on the psychological aspect of nail biting. The habit is given the term “onychophagia”. It is considered a “pathological oral habit and grooming disorder characterized by chronic, seemingly uncontrollable nail biting that is destructive to fingernails and surrounding tissue”. Onychophagia falls under the umbrella of body-focused repetitive behavior disorders (BFRBDs). Other BFRBDs include: frequent cheek and lip biting, nail picking, and hair pulling. 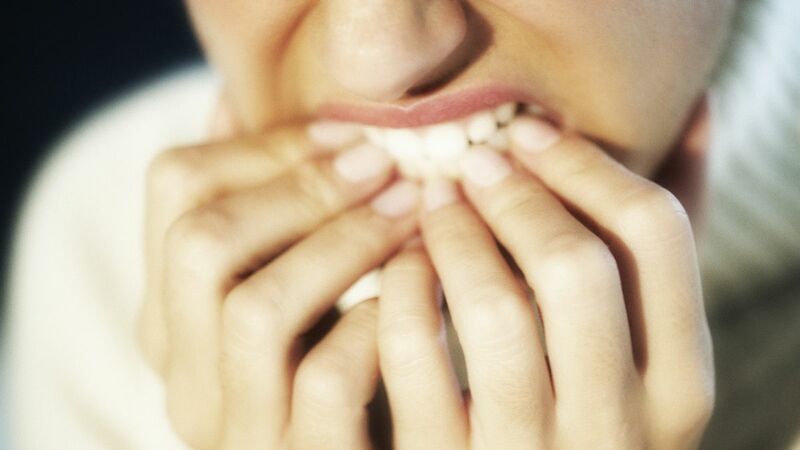 There are many causes for nail biting, including a possible genetic link. According to Psychology Today, some people appear to have an inherited tendency toward developing BFRBDs, as well as having higher than average rates of mood and anxiety disorders in immediate family members. People who bite their nails report that when feeling anxious or stressed, they will get feelings of relief or pleasure after biting. Nail biting is associated with anxiety; the act reportedly relieves stress, tension, or boredom. It is also related to attention deficit hyperactivity disorder (ADHD), oppositional defiant disorder, separation anxiety, and other mental health issues. The aftermath of a high anxiety week. 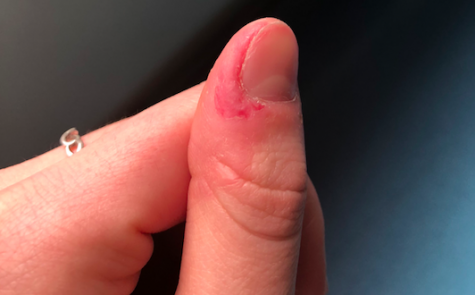 While it may seem like an innocent habit, there are risks that nail biters must be aware of. Not only can the practice damage the skin around the nail, it can harm your teeth, and increase the risk of infections by spreading germs from your fingers to your mouth. By putting your dirty finger in your mouth, you risk consuming bacteria. In order to quit, The Mayo Clinic suggests to avoid factors that trigger nail biting, and to take healthy steps to manage anxiety like getting active. Perhaps the most traditional and effective way to quit is to apply a “bitter tasting lacquer” to discourage biting. Keeping your nails manicured and trimmed, as well as occupying your hands or mouth with another activity such as playing a musical instrument or chewing gum can help to end the habit. I have tried everything, from bad tasting nail polish to constantly having bandaids on my thumbs. In fact, writing this article now I have found myself putting my fingers in my mouth. Though this habit has provided comfort in high anxiety situations, it is something that I hope to overcome.